This isn’t a post about Brexit; it really isn’t. Nor is it a post about banning the burqa. It isn’t even a post about Boris, or whether what he said about women who wear a burqa was funny or not. Opinions on these things vary from ear to ear: humour is manifestly in the mind of the auditor. It isn’t a post about jumping on bandwagons, or whether those who jump can tell their burqa from their niqab, or either from a hijab. It isn’t a post about religiously illiterate politicians, letterboxes, bank robbers or crass similes. It isn’t about hate speech, kneecapping, or witch hunts. Nor is it a post about bashing bishops. Really, it isn’t. It is simply a polite question. A number of clergy (quite a few, actually) have expressed their disgust at Boris Johnson’s joke about disparaging of women who wear a burqa. In comparing them to letterboxes and bank robbers, he clearly caused offence (or people chose to take offence), and cries have gone up of Islamophobia (notwithstanding his being of Turkish-Muslim heritage). The Bishop of Liverpool said Boris’s similes were “dreadful” (or is saying Boris is dreadful? ); the Bishop of Bradford said his similes were “harmful“. But this isn’t a post about Boris, bishops or similes. Nor is it a post about bandwagon-jumping. It is simply to ask these bishops (and other anti-Boris bandwagon-jumping clergy) why they so readily pour scorn and brimstone upon Boris’s head, but remained totally Trappist when Shadow Foreign Secretary Emily Thornberry said she wouldn’t let a woman wearing a burqa look after her child or elderly mother; and when the Guardian mocked the garment mercilessly as a scary Halloween costume, a fire-blanket and a letterbox; and when the BBC broadcast that very same ‘letterbox’ simile; and when Polly Toynbee said the burqa was like something sinister out of a horror film (or three horror films, actually), and “an instrument of persecution.. a public tarring and feathering of female sexuality [because it] transforms any woman into an object of defilement too untouchably disgusting to be seen”? Is it not preferable to be likened to a letterbox than to be judged “untouchably disgusting”? If the former Foreign Secretary caused such grievous offence to Christian sensibilities by comparing a burqa to a letterbox (he meant niqab, but never mind), why did no clergy condemn the Shadow Foreign Secretary for telling the world that a woman clad in a burqa/niqab isn’t a fit person to care for children or the elderly? Why does the Bishop of Liverpool, Paul Bayes, presume to judge Boris Johnson’s motives (“..to provoke, and benefit from, anger and fear”), but not those of Emily Thornberry? Are not her comments actually far more dehumanising (indeed, de-maternalising) than crass references to a letterbox? Why does the Bishop of Bradford, Dr Toby Howarth, judge Boris’s similes to be “inappropriate”, but not Emily Thornberry’s downright smear of Muslim mothers’ and daughters’ ability to love and care? “The environment that we create with our words and ridicule is dangerous,” says Dr Howarth. “When we are trying to have conversations about coverings and Muslim dress, trivial comments like this make it so much harder.” What about the rather more serious comments of the Shadow Foreign Secretary? Or is what she said on ‘Question Time’ rather less important than what a Tory backbencher wrote in the Telegraph? “As Bishop of Bradford, I have been part of these conversations,” Dr Howarth continues, “and then Boris Johnson makes these jokes, and it impacts on our ability to create a safe space to discuss these issues.” Does Boris really make it more difficult to create a safe space to discuss these issues than Polly Toynbee saying such women become “untouchably disgusting”? Or does Polly get a pass from clergy because she’s on the enlightened and compassionate left? Or is it because she writes for the noble and progressive Guardian? Or is it because she supports remaining in the EU, and so her thoughts and ways are pure and wise? A bit like the thoughts and ways of Emily Thornberry? That’s it, isn’t it? 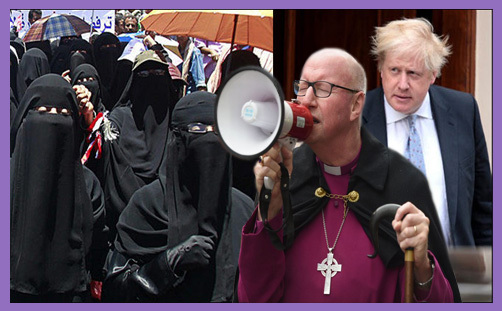 Those bishops who are jumping on the Boris burqa bandwagon presume to judge his motives because he’s pro-Brexit, so his heart must be deceitful and wicked; he must, of necessity and by definition, be selfish, racist, arrogant, ambitious, xenophobic and proud. Funny, isn’t it, how bishops who righteously defend face-covering cultural garb like burqas and niqabs are content to inculcate cynicism and spread contempt for “right-wing headbangers” like Boris Johnson, and stir up ‘hate’ against him by judging his motives or exaggerating the effects of his words. Have any of them commented on Jeremy Corbyn’s wreath-laying, terrorist-honouring lies; or, indeed, uttered a word about Labour’s increasingly pervasive antisemitism? Aren’t such issues rather more serious than Boris Johnson’s allusions to letterboxes and bank robbers? Perhaps, instead of cursing or condemning Boris, the Bishops of Liverpool and Bradford might encourage their flocks to pray for him, and give thanks for him, so that he and all of us might lead a quiet and peaceable life in all godliness and honesty. For this is good and acceptable in the sight of God our Saviour (1Tim 2: 1-3). Or is only for Emily, Polly and Jeremy that bishops will lift their holy hands? Is Boris so beyond the pursuit of justice and love that he is not worthy of episcopal grace and courtesy? Is his being so uniquely indecent and dangerously divisive that his motives – his motives –may be judged and condemned as the fulfilment of his petty, base and prejudiced life? What happened to ‘Judge not, that ye be not judged‘? The primary principle of Christian ethics begins with respecting each and every person simply as a person. We are all imperfect and fallen – capable of compassion or cruelty; generosity or enmity; brilliance or supreme folly. These are choices we make. But none of our corruptions or offences was ever made good by self-righteous pontifications or the sort of insular smugness which now pervades the First Estate. Perhaps tweeting and bleating bishops might take a leaf out of Wisdom: ‘A soft answer turneth away wrath: but grievous words stir up anger‘ (Prov 15:1). Far better to send Boris a polite email or a quiet DM inviting him over for a cup of tea, than to trumpet to the whole world how deceitful and dreadful you think he is.